Build beautiful interactive maps on your Drupal website, and tell engaging visual stories with your data. This concise guide shows you how to create custom geographical maps from top to bottom, using Drupal 7 tools and out-of-the-box modules. You&#8217;ll learn how mapping works in Drupal, with examples on how to use intuitive interfaces to map local events, businesses, groups, and other custom data. Although building maps with Drupal can be tricky, this book helps you navigate the system&#8217;s complexities for creating sophisticated maps that match your site design. 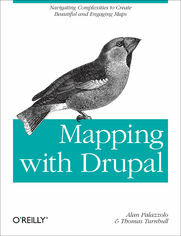 Get the knowledge and tools you need to build useful maps with Drupal today.